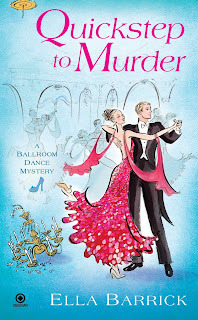 Today, Lila Dare and Killer Characters are thrilled to host Anastasia "Stacy" Graysin, the professional ballroom dancer from Ella Barrick's ballroom dance mystery series. 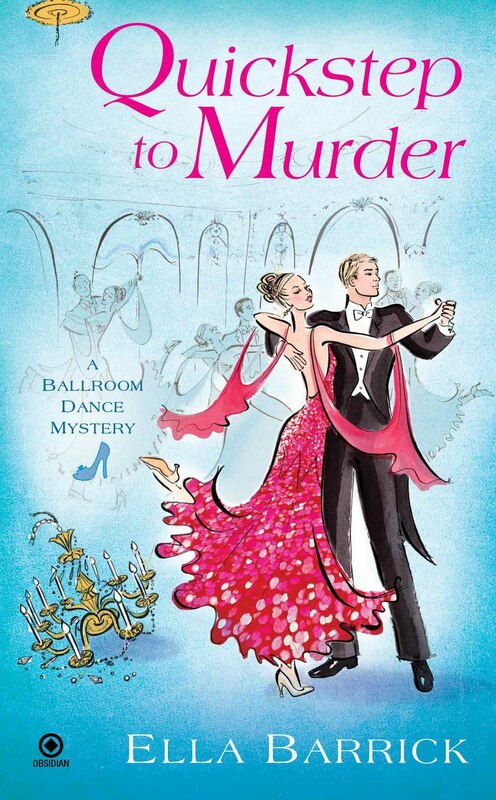 The first in that series, Quickstep to Murder, was released on 6 Sep. In it, Stacy stumbles over the body of her dead dance partner and ex-fiance, Rafe, in their ballroom, and must solve the murder before the police waltz her into prison. Ever since I started ballroom dancing--I was ten years old--and especially since I've been competing internationally, people ask me what it's like. "It sounds so glamorous," they say enviously. Well, it's true I get to perform in satiny gowns decked with rhinestones or sequins or feathers, but the truth is that dancing is darn hard work. Whenever people ask that, I think of the song "The Glamorous Life" from the musical A Little Night Music; the song's about an actress's life, only she makes it clear that there's very little glamour. Dancing's like that. To start with, I have to watch every bite I put in my mouth so I don't gain an ounce. Costumes are expensive--upwards of $2500 for one dress--and I can't afford to grow out of them. Plus, my partner doesn't want to heft an ounce more than he has to when we do lifts. What's glamorous about not eating pizza or ice cream, and subsisting on Caesar salads minus the dressing and croutons (which is the only thing that makes them edible)? Then, I train every day. I do Pilates and light weight training so I'll have defined but not bulky muscles, and I attend ballet and jazz classes. Murder on the feet! I also teach at least one group class each day and usually do several private lessons. I've also recently started a ballroom cardio class which is very popular at Graysin Motion, my dance studio in Old Town Alexandria, Virginia. For competitions, I have to get up around 4:30--yes, in the morning--so I can do my make-up and hair. False lashes, and rhinestones in my hair part may look glamorous, but they're a pain in the you-know-what to apply. And do you know how hard all that make-up is on your skin? But I have to do it: the judges have eagle-eyes and will mark us down for sloppy lipstick or a chipped manicure. I really enjoy the bling, though! Bracelets and necklaces and earrings, oh my! The bigger and sparklier the better. I can't resist estate sales where I can pick up fabulous pieces for only a few dollars. I also have to contend with injuries, like any athlete. Feet, knees and backs are especially vulnerable. If I were rich, I'd have a masseur on staff to massage my poor feet every night. Remember what they said about Ginger Rogers: She did everything Fred Astaire did, only backwards and in high heels. I'm not complaining, though. I'm passionate about what I do and it pays the bills. How many people can say that? I hope you'll drop in the studio and let me give you a twirl around the floor if you're ever in Old Town Alexandria. First lesson's free! Thanks for stopping by Killer Characters today. While you're here, why not fill us in on the common misperceptions about your job? When people hear that I own an embroidery shop, they picture their grandmother sitting with needle and embroidery floss and hoops, sewing by hand. I'm working with software and computers, and my machines do the stitching. It's faster, but will never quite be the same as hand embroidery. Doesn't hurt the feet like dancing, though, Stacy! Oooh, I'd rather talk about ballroom dancing... love watching it! Now that DWTS is on, I get my fix every week. Have you ever thought of trying out to be on that show as a professional? Great idea, Victoria...but that might mean some bodies -- dead ones -- might be involved. I love all the glam that goes with ballroom dancing. Good luck, Stacy! I just cannot wait to read this book!!! It always amazes me how much time is spent getting yourself together for 4 minutes of dance. Enjoyed the book. Hi all--Thanks for dropping by today. It's so fun to talk about ballroom dancing! Willow--I'm fascinated by your comments about embroidery. It's marvelous that you can make a living that way. Victoria--Funny you should ask about DWTS. There's another show--Ballroom with the B-Listers--and there's a chance that Graysin Motion, my studio, will be chosen to host it. Sssh! Erika--There will definitely be dead bodies involved! I can't seem to get away from them. Misa and PJ--Thanks for wanting to read Quickstep. It's a lot of fun. Hi Dru--I'm glad you liked the book. Thanks for recognizing how hard it is to prepare yourself for a four-minute routine. I had no idea that you were an Old Town neighbor! I always thought ballroom dancing would be fun -- until today. Maybe we can just have coffee sometime.